We’re often told that you should never eat anything (or put anything on your body) if you don’t recognize everything on the ingredients list. But since most of us have no idea what xanthan gum or potassium benzoate are — or more importantly, what they’re doing to our bodies — we’re decoding the ingredients in the many things Americans put in (and on) themselves. This edition: Oscar Mayer Beef Bologna, which is made from 18 separate ingredients that we’ve broken down in the exact order they appear on their website. 1) Beef: Bologna is technically created through the process of “meat emulsion,” although “meat batter” may be a more accurate term. Essentially, the meat — beef, in this case — is ground into a paste, then stuffed into either a plant-based casing or a “natural casing” (aka, the intestines of an animal) for cooking. 3) Corn Syrup: Corn syrup is 100 percent glucose, a simple sugar derived from corn starch. This ingredient is likely added to soften the texture of the meat so it can be easily pumped into the casing. 4) Salt: This is added for flavor. 5) Potassium Lactate: Potassium lactate is salt derived from lactic acid, and it’s typically added to foods as a flavor agent and enhancer. It may also be added as a humectant, meaning it helps foods retain water and keeps them moist longer. Interestingly enough, potassium lactate is used in fire extinguishers as well, since it has fire-suppressant properties. While this may seem unnatural (and unhealthy), the FDA claims that potassium lactate is generally recognized as safe when added to foods at normal levels. 6) Ground Mustard Seed: Again, this is added for flavor. 7) Dextrose: Dextrose is a sugar derived from starches, like corn. Fun fact: Dextrose has a high glycemic index, meaning it quickly raises blood sugar levels, so it’s used in IV solutions to treat low blood sugar and dehydration. People with diabetes might also consume dextrose tablets to raise their blood sugar levels if they become dangerously low. Because of this blood sugar boosting effect, consuming dextrose also provides an almost immediate jolt of energy — then the inevitable crash. 8) Hydrolyzed Beef Stock: This ingredient is a flavor enhancer produced by boiling beef stock in hydrochloric acid, then neutralizing the solution with sodium hydroxide. The result is pure amino acids, which are often used to give processed foods a fuller flavor, similar to the way MSG is used. 9) Sodium Lactate: Sodium lactate is naturally derived from the fermentation of lactic acid (a compound produced when glucose is broken down and oxidized), and it’s usually added to meat and poultry products because the salt acts as a preservative, preventing bacteria and fungi from growing. Medicinally, sodium lactate can also be intravenously injected to remove drugs from the body after an overdose. 10) Autolyzed Yeast: Autolyzed yeast results when yeast is broken down into its individual components, which include the flavor enhancer MSG (more on that here). Because MSG is a natural component of autolyzed yeast, it doesn’t have to be listed separately on the ingredients lists — so watch out for this ingredient if you’re sensitive to MSG. 11) Sodium Phosphates: Sodium phosphates is a generic term that may refer to any sodium salt combined with phosphoric acid (which prevents the growth of mold and bacteria). They’re usually added as texturizers and emulsifiers, which allows for the uniform dispersion of numerous ingredients (something that’s especially important when blending up a bunch of meat, then pumping it into a casing). One study suggests phosphate additives contribute to the prevalence of chronic kidney disease, and the FDA even issued a safety warning concerning the use of over-the-counter sodium phosphate products to treat constipation. All in all, this is an ingredient to be wary of. 12) Sodium Diacetate: Sodium diacetate is an acidic sodium salt widely used as a preservative to control the growth of mold and bacteria in food. It’s also commonly added to meat and poultry as a pH regulator. 13) Sodium Ascorbate: This is more or less just a fancy name for vitamin C.
15) Dried Garlic: Once again, this is added as flavor. 16) Extractives of Paprika: Surprise! More flavor. 17) Flavor: While natural flavors are quite literally flavors derived from an actual food source — i.e., mustard taken from a real mustard plant — artificial flavors are chemical compounds created in a lab that mimic a natural flavor in some way. 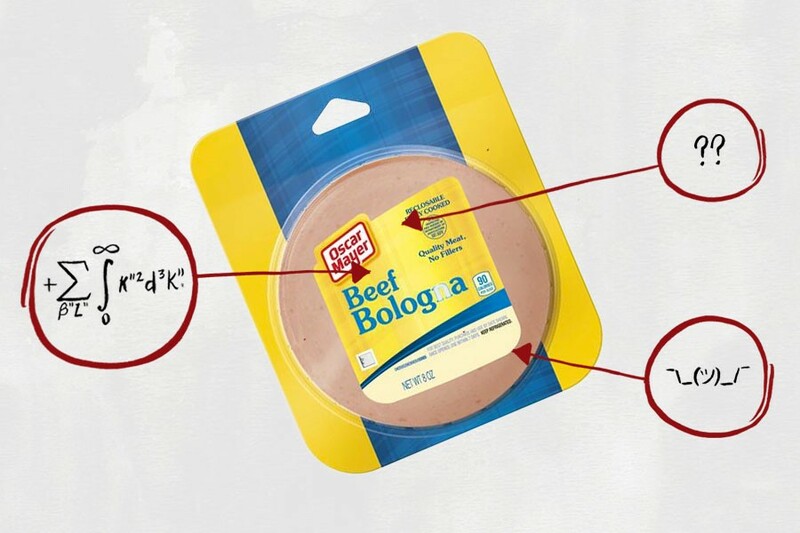 Whether the flavor in this bologna is natural or artificial isn’t clear, but it doesn’t matter much either way: Neither are a real cause for concern. 18) Celery Seed Extract: Even more flavor. Now, as if the meat’s mysterious source weren’t disconcerting enough, this bologna also contains sodium phosphates (which can wreck your kidneys) and sodium nitrites (which can cause cancer). All in all, this bologna is full of bologna.